Last year, I took a picture of Jeff on his first Father’s Day holding Gabi by the staircase. She was smiling and squirming, he was beaming. This year, as the two of them cuddled on the couch and read Tumble Bumble, I took pictures and made breakfast. Jeff loves waffles. So this is what I made him. Appropriately, this recipe comes from Hungry Monkey, a hilarious book about a Dad trying to raise an adventurous eater. How good are are these waffles? “…yeasted waffles are better than waffles with bacon in them,” Matthew Amster-Burton, writes. Agreed. There are a million and one ways to make waffles. But if you haven’t tried yeasted ones you’re missing out. The texture is much better than regular waffles. They brown better and they’re crispier. And you do most of the work before bed. You let the batter get all bubbly on the kitchen counter over night. The next morning, just separate two eggs. Stir the yolks into the batter. With a hand mixer, whip the whites until they hold peaks. The whites then get folded into the batter. The yeast and whites makes the waffles nice and airy. Jeff shared his waffles with Gabi as I made more. They loved every bite. This batch made around 14 waffles. Leftovers can be frozen and reheated in a toaster. The night before, mix the flour, sugar, yeast, and salt in a large bowl. Add the butter and stir until well combined. Stir in the milk and vanilla, leaving a few lumps. Cover with foil, plastic wrap or a loose fitting lid and leave overnight at room temperature. The next morning, the batter should be a bit frothy. Stir in the yolks. Whip the whites to stiff peaks and fold gently into the batter using a spatula. 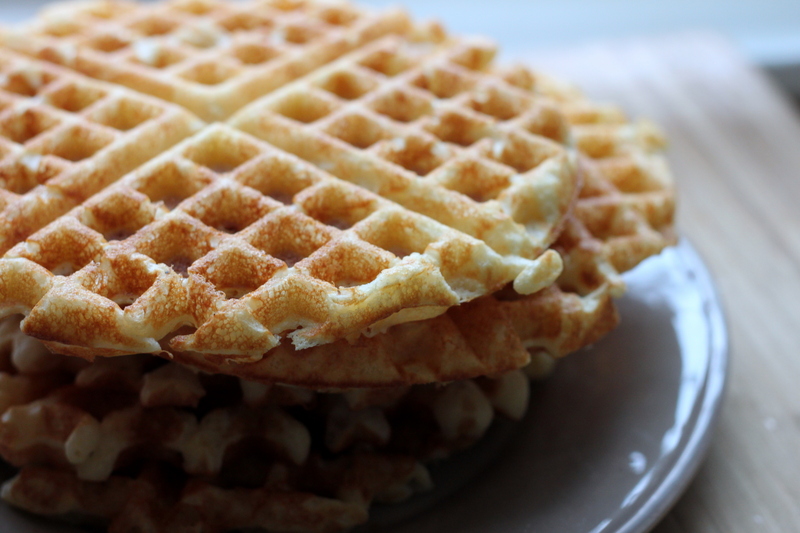 Pour an appropriate amount of batter onto a preheated waffle iron. Cook five minutes or so, depending on the strength of the iron.